Win a vanity pack worth $1,000 including the new Dyson Supersonic hair dryer! 1. The promoter is GWA Group Limited ABN 35 000 189 499 whose registered office is at Level 1, 7 – 9 Irvine Place, Norwest Business Park, Bella Vista, NSW, 2153 (Promoter). 2. 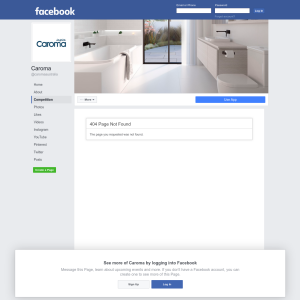 The Caroma Vanity (Competition) will commence at 12.00pm (AEST) on 3 August, 2016 and ends at 11.59pm (AEST) on 31 August, 2016 (Competition Period). 4.The Caroma Vanity competition is only open to Australian residents, over the age of 18. 5. Employees of GWA Group Limited or their family members or anyone else connected in any way to the competition or helping to set up the competition shall not be permitted to enter the competition. 8. Enter your details and answer to the question in the form provided. 9. All entries must be received within the Competition Period. Entries are deemed to be received at the time they are received by the Promoter and not at the time of submission by the entrant. 10. The Promoter is not liable for entries not received for whatever reason. 11. Only one entry is permitted per person. a. The Winner of the Competition with valid entry (as determined by the Promoter) will receive one Dyson Hair Dryer and one hair care pack, valued up to $1,000.00. 13. The Promoter's (or its nominee's) decisions are final and no correspondence will be entered into. No cash alternative to the prizes will be offered. The prizes are not transferable. 14. The Winner will be notified by email and/or phone within 28 days of the closing date. The names will be published on the Caroma Facebook Page on Wednesday, 7 September, 2016. 15. The Promoter, any fulfilment company and its associated agencies and companies, will not be liable for any damage in transit to, or delay in transit of, any prize. 16. The promoter is not responsible for inaccurate prize details supplied to any entrant by any third party connected with this competition. 17. If a winner cannot be contacted or do not claim the prize within 14 days of notification, we reserve the right to withdraw the prize from the winner and pick a replacement winner on Monday, 26 September, 2016 in accordance with the procedure outlined above. 18. If any prize remains unclaimed after 30 September, 2016, the Promoter may retain the prize and is under no obligation to find a further alternative winner. 19. Entrants acknowledge that entries may be posted on to the Caroma Facebook Page (entrant's Facebook profile names will also appear) and be available for public viewing and comment. Entrants consent to such publication of this material. 20. When any entrant submits, produces or distributes any material in relation to this Competition (Content), the entrant, unless the Promoter advises otherwise, licenses and grants the Promoter, and their affiliates and sub-licensees a non-exclusive, royalty-free, perpetual, worldwide, irrevocable, and sub-licensable right to use, reproduce, modify, adapt, publish and display such Content for any purpose in any media, without compensation, restriction on use, attribution or liability. Entrants agree not to assert any moral rights in relation to such use and warrant that they have the full authority to grant these rights. 22. The Promoter will not, unless consent is obtained use this information for promotional, marketing, publicity, research and profiling purposes, including sending electronic messages or telephoning the entrant. i. you grant the Promoter and associated companies and agents the right to use (and to license others to use) your entry, your name and likeness to promote and advertise all or any of the Competition or the Promoter without any royalty, payment or other compensation to you. ii. You may at any time prior to 31 August, 2016 notify the Promoter that you do not wish for the Promoter and others (who are licensed to do so) to use your name and likeness or entry as described above by notifying the Promoter in writing on marketingcommunications@gwagroup.com.au or calling 1800 227 662 during office hours and communicating this request clearly to the Digital Campaign Manager. iii. The Promoter agrees not to use your name or likeness or entries in connection with any commercial tie-ups, merchandising or for the direct or indirect endorsement of any product or services other than for the commercial and/or other sponsorship of the Competition or the Promoter. 25. This promotion is in no way sponsored, endorsed or administered by, or associated with Facebook, twitter or any other social network. You are providing your information to GWA Bathrooms and Kitchens and not to any other party. 26. Participation and entry in this Competition is conditional upon the entrant complying with all rules, regulations and guidelines set down by Facebook. 27. Entrants agree that they are fully responsible for the Content they submit, produce, share and/or distribute. The Promoter and its associated companies and agents shall not be liable in any way for such Content to the full extent permitted by law. vi. the Promoter reserves the right to disqualify any entrant who submits or uploads any material that does not comply with these Terms and Conditions. 29. Without limiting any other terms herein, the entrant agrees to indemnify the Promoter for any breach of these Terms and Conditions. 30. The Promoter reserves the right to cancel or amend the competition and these terms and conditions without notice, subject to the approval of the gaming authorities in each state and territory, if required, in the event of catastrophe, war, civil or military disturbance, act of god or any actual or anticipated breach of any applicable law or regulation or any other event outside of the promoter’s control. Any changes to the competition will be notified to entrants as soon as possible by the promoter. 31. The Promoter’s decision in respect of all matters to do with the competition will be final and no correspondence will be entered into. 32. Nothing in these Terms and Conditions limit, exclude or modify or purports to limit, exclude or modify the statutory consumer guarantees as provided under the Competition and Consumer Act, as well as any other implied warranties under the ASIC Act or similar consumer protection laws in the State and Territories of Australia (Non-Excludable Guarantees). Except for any liability that cannot by law be excluded, including the Non-Excludable Guarantees, the Promoter (including its respective officers, employees and agents) excludes all liability (including negligence), for any personal injury; or any loss or damage (including loss of opportunity); whether direct, indirect, special or consequential, arising in any way out of the Competition. vii. participation in the Competition. 34. The competition and these terms and conditions will be governed by Australian law and any disputes will be subject to the exclusive jurisdiction of the courts of NSW.